Recently Solange was featured on Essence.com and she spoke about her hair – its hard to talk about Solange’s style without including her hair which she cut off years ago and got much coverage for it and even is an ambassdor for Carol’s Daughter brand (some how this endorsement does rebut the VP of Natural hair comment she made but that is not what we are discussing today) – what prompted Solange to tweet the above was the comments that were made following her Essence feature, the natural hair nazis came out and commented on how she needed to do more twist-outs, her hair looked unkempt (now I have seen unkempt natural hair in the past few days so much so I was tempted to throw my scarf over one woman’s head and Solange’s hair is far from unkempt! ), she needed more curl definition and other natural hair lingo things. 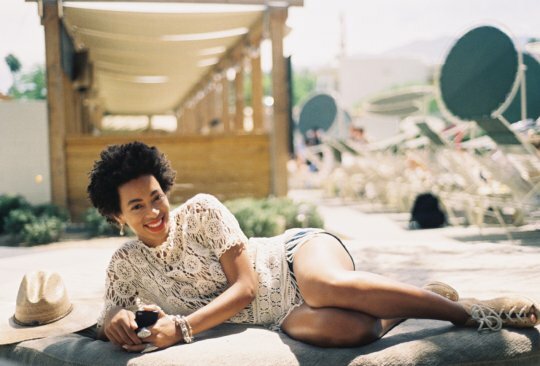 Some have commented that it is because she cut her hair and went natural that Solange received more media attention and stepped out from behind Beyonce’s shadow. 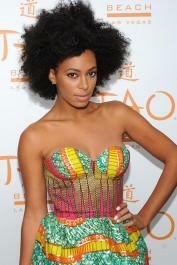 We are from the school of thought that both her hair and fashion sense has definitely put Solange more out there. Solange is signed to Next Model Management, has a Tumblr blog that we here at Chaud love so much. We loved her unique and different music , T.O.N.Y was the jam when it was released. At the present moment it seems she is focusing more on the fashion side of things and maybe writing songs behind the scenes. It would be great for her to put an album out soon as us her fans are waiting for more, hard I guess for her to be compared to her sister but their music is totally different each great in their own unique way. Editor’s Note: I do echo the same sentiments as Solange in that hair is not that important – it does not define any-one. My hair journey went from having dreadlocks to cutting them off, relaxing my hair, hair breaking and then me giving up relaxers and being natural, I however do not rock my natural hair and opt for weaves. Most recently I contemplated cutting my hair but have opted to now just wear short weaves. We are all different, our hair is most certainly different and I feel the hair nazis should not be out there waving their placards trying to occupy our hair but leave each to their own and their hair types and choices. 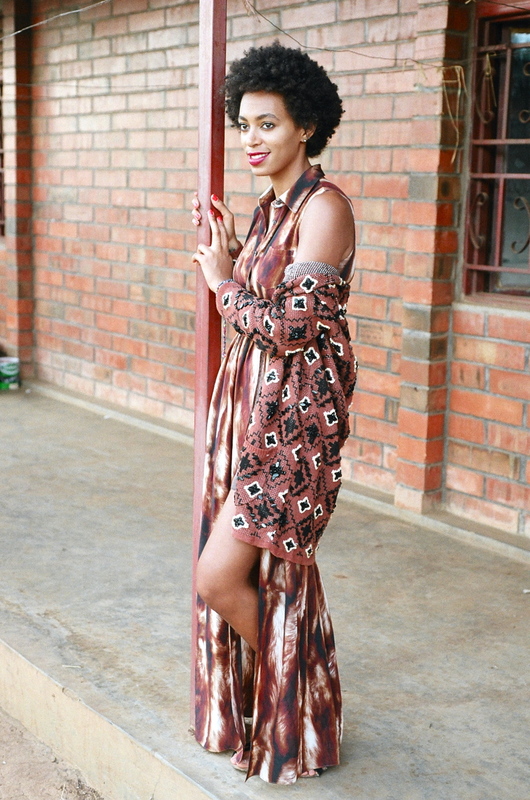 We at Chaud love those who wear their natural hair, relax their hair or wear that 32” Brazilian/Mongolian/Ugandan weave! Solange cutting her hair = defining herself as individual! She that doth protest too much – how can she say she’s not VP of natural hair but all over Carol’s Daughter?C’mon now! 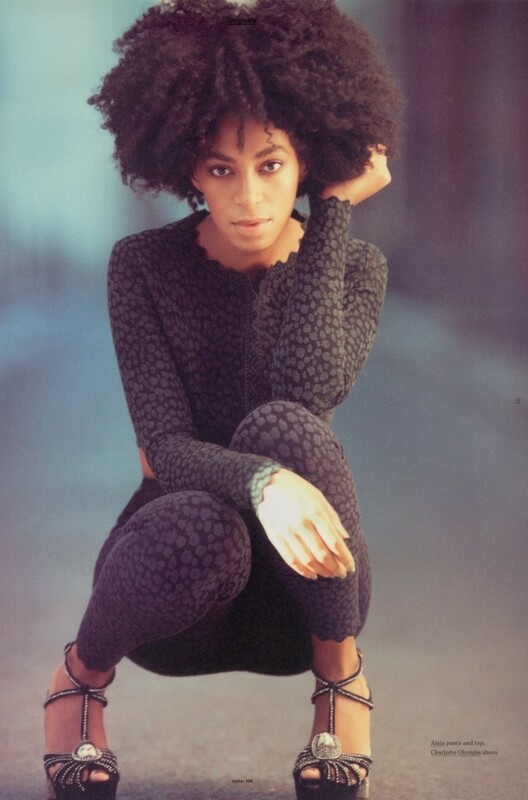 Regardless I love me some Solange and her very good natural hair weaves!! Ditto to Editor’s note. Lol @ ‘ hair nazis should not be out there waving their placards trying to occupy our hair ‘ and as a Ugandan ‘Ugandan Weave’ made me chuckle.Nakupenda already for your humour – assuming you get Swahili. The fro IS tired. I know she’s yall idol Beyonce’s little sitesr and all, but that don’t mean she can’t be called out, or that nobody can have an opinion about her. I’m a fan of natural hair, but I never liked fros on ANYONE. Solonge is not really a pretty girl, so she has to be careful how she wears her hair, and because her face is so long she REALLY has to watch it. The girl looks like Orlando Jones I’ve been saying this for years. She looks cute with the braids or something longer because of her long face. Short updos don’t fit her at all that is my opinion and I stand on it. As a person and an artist, I think she’s fly, just not her hair. One last note the child dresses like a 60 year old socialite. Not a good look either but I like her new song though see, saying something nice. you are stupid. She’s very pretty and her hair looks nice.